The park has short trails including a nature trail. 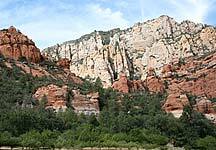 It is also close to several Coconino National Forest hiking trails. This area is managed on a pack-it-in, pack-it-out basis, and any type of glass containers are strictly prohibited. Pendley Homestead Trail: 0.25-mile trail with a difficulty rating of easy. This paved, level trail is suitable for all visitors and travels through a portion of the historic Pendley Homestead of Slide Rock State Park. Features along the trail include some of the original apple orchards, Pendley Homestead house, tourist cabins, apple packing barn, various farming implements that were used historically in the homestead, a new orchard of semi-dwarf apple trees, and spectacular views of the canyon walls of Oak Creek Canyon. Slide Rock Route: This is a 0.3-mile trail with a difficulty rating of moderate. This primitive route along Oak Creek is the main access to the Slide Rock Swim Area. This extremely popular area features a natural water slide along Oak Creek. This path begins near the apple packing barn. It descends to the creek via steps where it then crosses the creek via a small footbridge. During periods of high runoff, the footbridge will not be in place and visitors will need to stay on the west side of the creek. After crossing the footbridge, proceed north along the sandstone shelves. In the summer months, many sunbathers will be using some of this route for sunbathing, therefore, you may have to step over quite a few of them. As you proceed, you may notice a historic rock cabin on the west side of the creek. The original homesteader used this in conjunction with a flume and water wheel to generate electricity for the homestead. You will arrive at an eight-foot wall that can be your turn-around point. If you decide to negotiate the wall, you can explore the remote areas upstream where the route becomes more primitive. Clifftop Nature Trail: This is a 0.25-mile trail that begins near the apple barn and offers scenic views of the Slide Rock Swim Area.